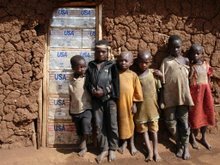 On Saturday 24, February 2007, as a refugee woman went about her business in the nearby bush within the Ikafe refugee settlement - Yumbe district (Northwestern Uganda), she stumbled on a young girl taking a nap on bare ground. What started as Samaritan move for the refugee woman, resulted into a realisation that the young girl was a former Lord's Resistance Army (LRA) rebel, fleeing captivity. She was later taken in to the Officer in Charge of Ikafe police post, who later called in the Yumbe district Police Constable. SHRA staff had an opportunity of interviewing the girl before she was taken to the district police station. Mary Konga-nee name, was captured in 2002 in Mungulu area-Adjumani district, where she had been taken to babysit her Auntie's child. Since then, the world took a horrible turn for her. She was forced into early marriage to a rebel commander with whom she bore a son with. 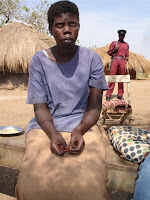 She was also forced to drop her nee name for Mariamu Annet as a ritual for all captives. The memories she has of her captivity was living by the gun, terrorising villages when sent on mission. Mary says, she saw the peace talks as an opportunity to return to her mother and father, who by the time of her capture lived in Yumbe, but as of now does not know where they are. The disappointment came when, they were ordered to reorganise and relocate by the LRA top commanders. She seized this opportunity to flee captivity; living all she had behind - including her only son, she run away in the night with only a hand grenade as a weapon. She says her journey had taken her roughly five days - where she walked in the night, and rested during the day. At the time of SHRA's visit, the settlement authorities were awaiting the District Police Constable to take her for further protection and interrogation.